E3 2017 highlights: consoles, 4K games, audio technology | What Hi-Fi? 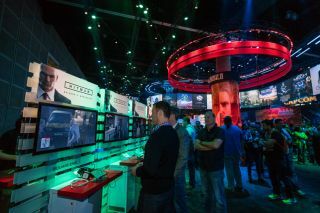 E3 is the world's biggest video gaming show - every year, the industry descends on the Los Angeles Convention Centre for three days of non-stop games, gear and gabbing. But, it's not all about the games (although there have been a number of big announcements). With the likes of Sony and Microsoft in attendance, there's plenty of news for AV enthusiasts, too. This year's line-up includes Microsoft's new Xbox One X games console, complete with 4K HDR gaming and Blu-ray support, possible advancements for Sony's PSVR virtual reality headset, and more. What was codenamed Project Scorpio now has an official name: Xbox One X. Its focus is very much on 4K. While the Xbox One S supported UHD Blu-rays (albeit not brilliantly), it didn't support 4K games. The Xbox One X now noffers the whole package. It also upscales Xbox One games to 4K, and will be able to play games launched for the original Xbox. When it goes on sale on 7th November 2017, it will have no fewer than 22 exclusive games. There's no word on how expensive 4K games will be compared to their non-4K equivalents, but the list of launch titles includes Forza Horizon 7, Assassin's Creed Origins, Minecraft 4K and Anthem. So what of the console itself? Unsurprisingly, it packs a serious amount of gaming power. According to Microsoft, it's the most powerful games console ever made. Inside is a custom eight-core CPU running at 2.3GHz, which is 31 per cent faster than the standard Xbox One. The GPU consists of 40 custom compute units running at 1172MHz, delivering six teraflops of computing power (way more than the PS4 Pro's 4.2). It also has more memory. There's 12GB DDR5 of RAM, nine of which are available for developers to play with. That gives it 326GB/s of bandwidth, which is significantly more than the PS4 Pro and Xbox One S.
1TB of onboard storage comes as standard, and you can bolster this with an external hard drive. Despite these powerhouse specs, the One X is actually Microsoft's smallest Xbox to date. It should also be whisper-quiet, thanks to its liquid-cooled vapour chamber. It supports Dolby Atmos from the off, as well as Microsoft's proprietary HRTF audio technology, which has been developed by the Hololens team. A duo of technologies - FreeSync 2 and VRR (Variable Refresh Rate) - should make video performance smoother and more stable on TVs and computer monitors, too. The Xbox One X will cost £449/$499 at launch. That's pricier than the PS4 Pro's £350 price tag, but then it does seem significantly more advanced. Sony is expected to go big on games at E3. Titles like Detroit: Become Human, God of War, Spider-Man, Unchartered: Lost Legacy, Days Gone, Death Stranding, and the Last of Us: Part 2 are all expected to make a splash. On the hardware side of things, Sony could well announce something new for PlayStation VR, its virtual reality system for the PS4. It's been a quiet few months for the platform, but now it's getting classic first-person shooter Doom in the form of Doom VFR, expect things to get a lot louder. Could the PS4 Pro get an upgrade in the shape of a 4K Ultra HD Bu-ray drive? It's one of the few holes in the console's current specs but whether Sony sees it as a gap that needs filling remains to be seen. At the tail end of last year, Sony added hi-res audio support to its PS4, so hopefully we'll see some more audio announcements from the firm at E3. Sony is also screening its press conference in cinemas across the US. That doesn't tell us much about what it'll announce, but it should make a more compelling viewing experience than watching at home on your laptop. Nintendo chose to focus on The Legend of Zelda: Breath of the Wild at last year's show but, now the Nintendo Switch is on sale, the company should have a lot more to show off. Super Mario Odyssey, ARMS and Splatoon 2 seem likely for its 'Treehouse' livestream system, with Super Mario Odyssey confirmed to be playable on the show floor. Nintendo will also host tournaments for both Splatoon 2 and ARMS. Beyond that, details are a bit scarce. Sadly, Nintendo Switch games only run at a maximum resolution of 1080p, and we're unlikely to see an upgrade to 4K announced at E3.